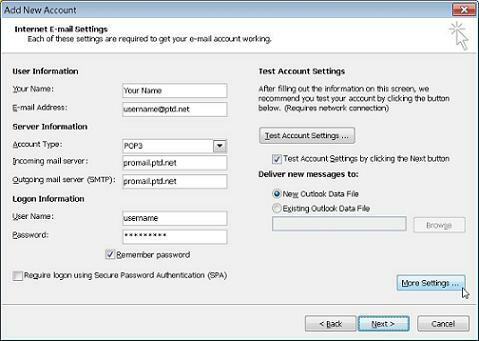 The following instructions will assist with configuring your email software to utilize PenTeleData’s email service. 1. 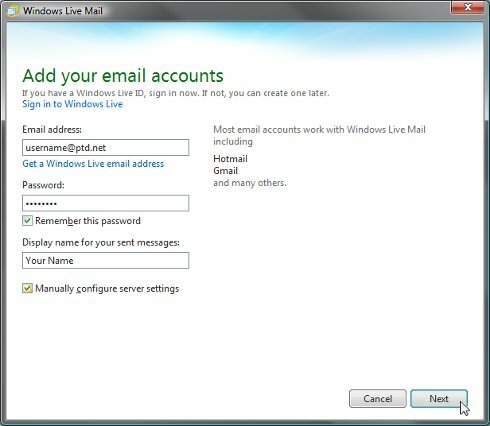 Begin by opening up Windows Live Mail 2011. The wizard will open. 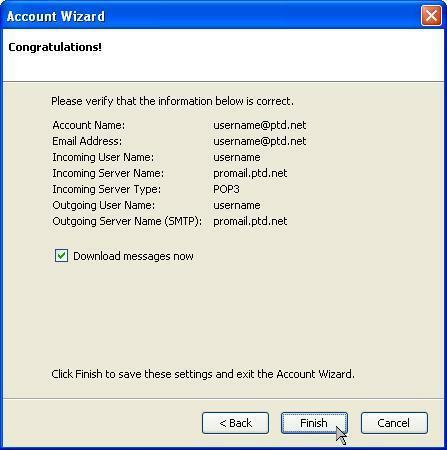 If the wizard does not appear, your email program may already be configured to send and receive email, please contact Technical Support at (800) 281-3564. 2. In the box labeled "E-mail address:", enter your PenTeleData email address. 3. In the box labeled "Password:", enter the password that corresponds to your "User Name" entered above. When typing your password, only a series of "***" will appear for password confidentiality. NOTE: Usernames and passwords are case-sensitive. Please be certain that your capitalization is correct. 4. In the box labeled "Display name for your sent messages:", enter your name as you would like it to appear when people receive email from you. 5. 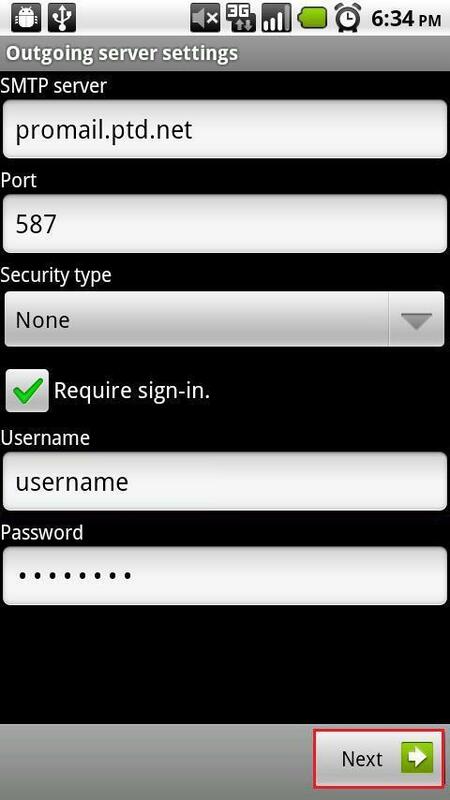 Place a check in the box next to "Manually configure server settings" and click "Next". 6. 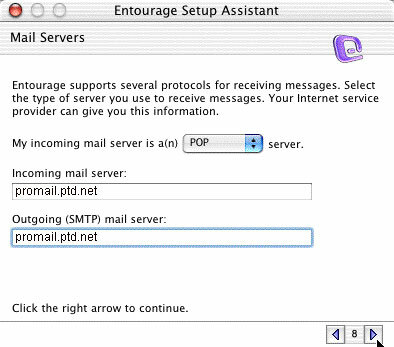 In the box labeled "Server address:" under the "Incoming server information" heading, enter "promail.ptd.net" in all lower case letters. 7. 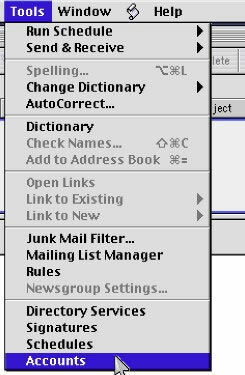 In the box labeled "Server address:" under the "Outgoing server information" heading, enter "promail.ptd.net" in all lower case letters. 8. Place a check in the box next to "Requires authentication" under the Outgoing server information heading and click "Next". 9. Click "Finish" to close the wizard. 1. Begin by opening up Outlook 2010. 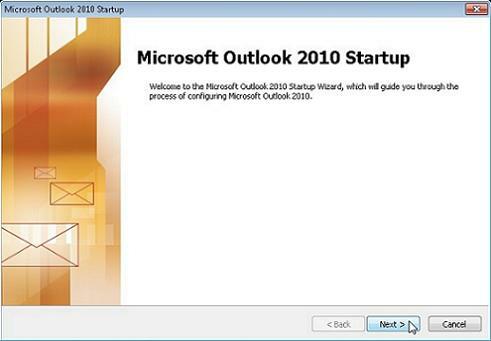 Once open the "Microsoft Outlook 2010 Startup" wizard will open. Click "Next" to continue. 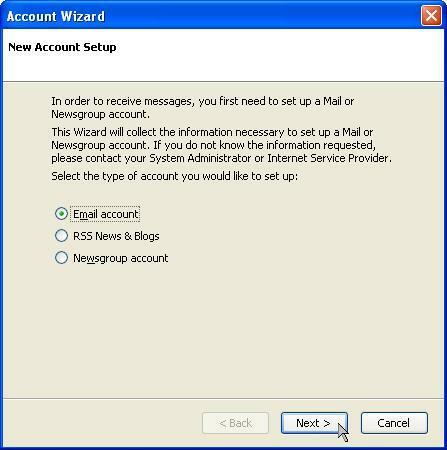 If the wizard does not appear, your email program may already be configured to send and receive email, please contact Technical Support at (800) 281-3564. 2. 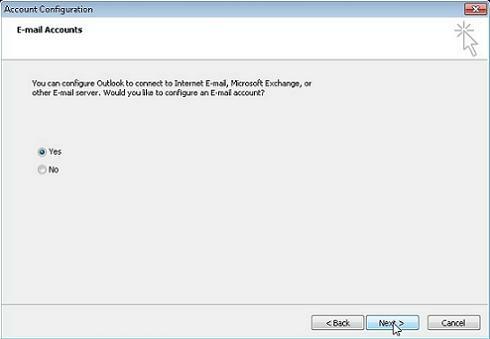 The Microsoft Outlook "Account Configuration" dialogue box will now appear. Place a dot next to "Yes" and click "Next". 3. Place a dot next to "Manually configure server settings or additional server types" and click "Next". 4. Place a dot next to "Internet E-mail" and click "Next". 5. In the box labeled "Your Name:", enter your name as you would like it to appear when people receive email from you. 6. 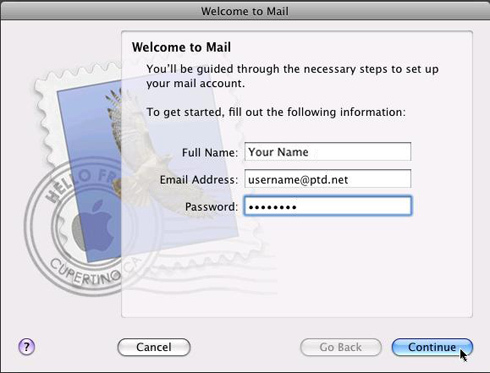 In the box labeled "E-mail Address:", enter your username followed by "@ptd.net" in all lower case letters. 7. In the box labeled "Account Type:", choose "POP3" from the drop down box. 8. 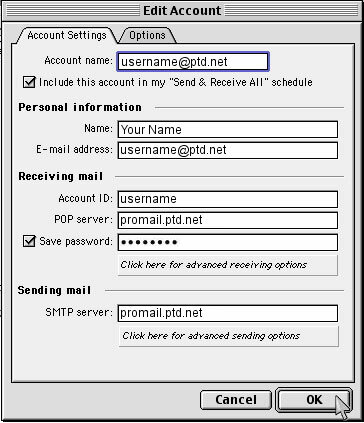 In the box labeled "Incoming mail server:", enter "promail.ptd.net" in all lower case letters. 9. In the box labeled "Outgoing mail server (SMTP):", enter "promail.ptd.net" in all lower case letters. 10. 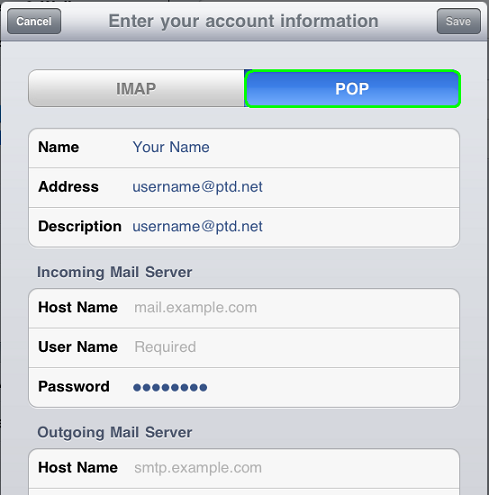 In the box labeled "User Name:", enter the beginning part of your PenTeleData email address. This is every thing before the "@ptd.net". 11. In the box labeled "Password:", enter the password that corresponds to your "User Name" entered above. When typing your password, only a series of "***" will appear for password confidentiality. 12. When your screen resembles the window below, click on the "More Settings…" button. 13. Click on the "Outgoing Server" tab on the top of this window. 14. 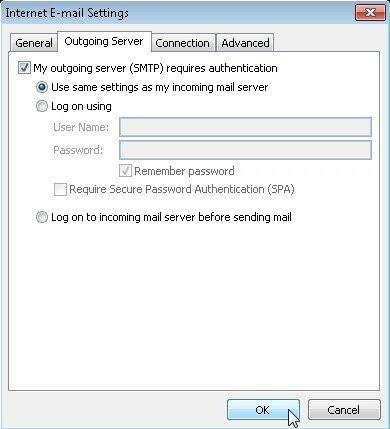 Place a check next to "My outgoing server (SMTP) requires authentication", by clicking your mouse over the box one time with the left mouse button. Then click "OK". 15. You will now be returned to the "Add New Account" window, click "Next" to continue. 16. The "Test Account Settings" window will now appear. When it is competed click "Close". 17. The "Add New Account" wizard has now been completed. Click "Finish" to close the wizard. 1. 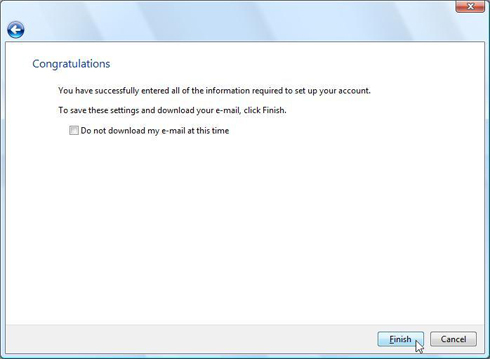 Begin by opening up Outlook 2011. 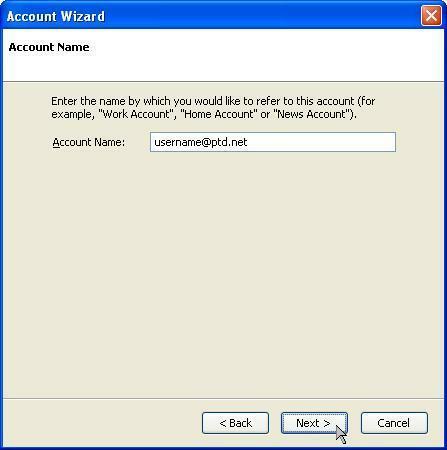 Once the program is open the “Add an Account” wizard will open. Click “E-mail Account” to continue. 2. 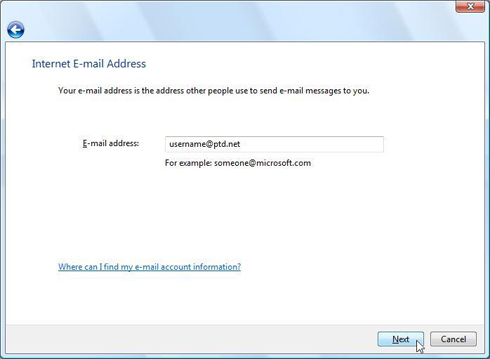 In the box labeled "E-mail address:", enter your username followed by "@ptd.net" in all lower case. 3. In the box labeled "Password:", enter the password that corresponds to you username. When typing your password only a series of "***" will appear for the password confidentiality. Note: Username and passwords are case-sensitive. Please be certain that your capitalization is correct. 4. In the box labeled "User name:", enter the beginning part of your PenTeleData email address. This is everything before the "@ptd.net". 5. 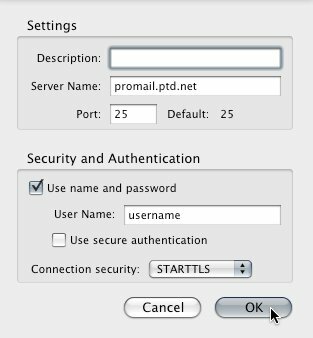 In the box labeled "Incoming server:", enter "promail.ptd.net" in all lower case. 6. 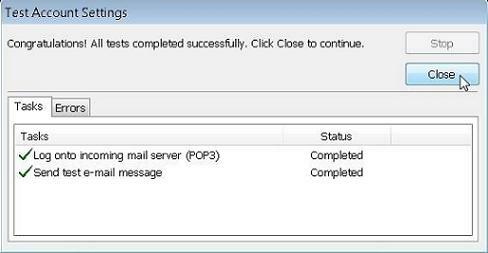 In the box labeled "Outgoing server:", enter "promail.ptd.net" in all lower case. 7. When your screen resembles the window below, click "Add Account". 9. From the "Authentication:" drop down box select "User Name and Password". 10. 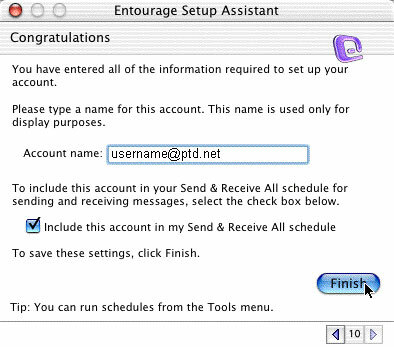 In the box labeled "User name:", enter the beginning part of your PenTeleData email address. This is everything before the "@ptd.net". 11. In the box labeled "Password:", enter the password that corresponds to you username. When typing your password only a series of "***" will appear for the password confidentiality. 12. When your screen resembles the window below click "OK". 13. You will now be returned to the "Accounts" screen. Click on the close button. 1. 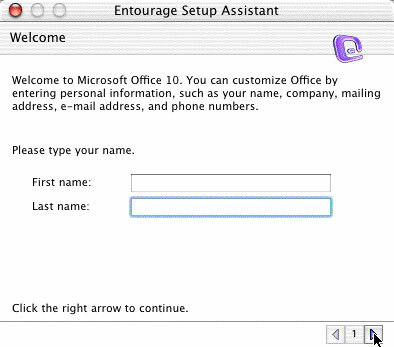 Open Microsoft Outlook by either selecting the "Microsoft Outlook" icon from the Windows “Desktop” or by selecting the "Microsoft Outlook" icon from the "Start" menu (known as the "Windows" menu in Vista). 2. 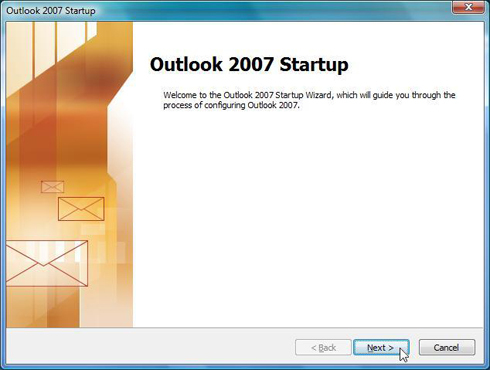 The "Outlook 2007 Startup" wizard will now open. Click on "Next" to continue. 3. 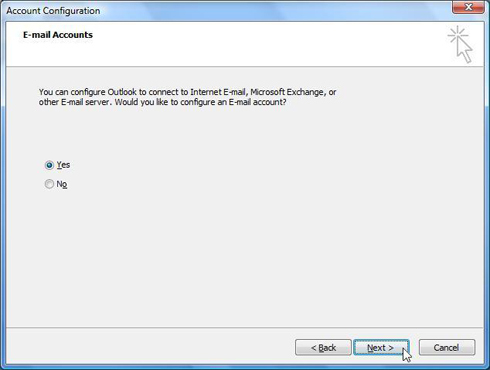 The Microsoft Outlook "Account Configuration" dialogue box will now appear. Place a dot next to "Yes" and click "Next". 4. 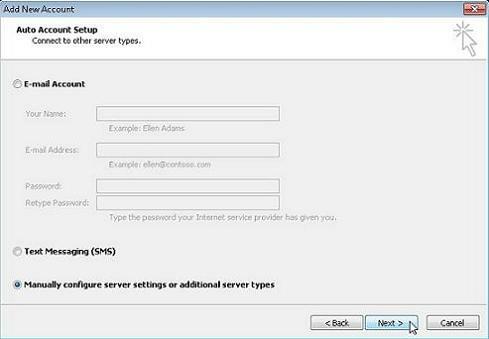 Place a check in the box next to "Manually configure server settings or additional server types" and click "Next". 5. Place a dot next to "Internet E-mail" and click "Next". 6. In the box labeled "Your Name:", enter your name as you would like it to appear when people receive email from you. 7. 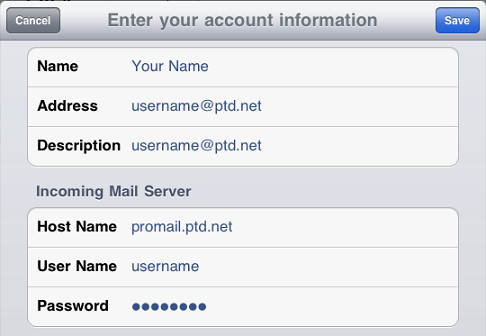 In the box labeled "E-mail Address:", enter your username followed by "@ptd.net" in all lower case letters. 8. 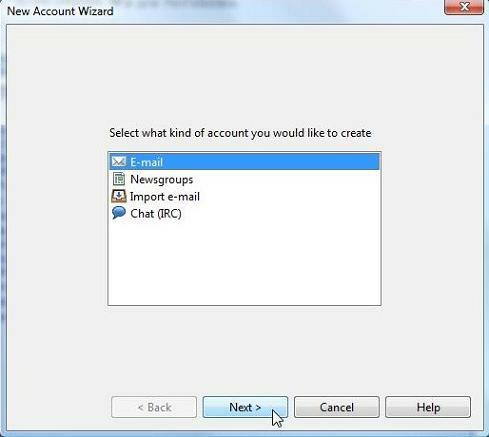 In the box labeled "Account Type:", choose "POP3" from the drop down box. 9. 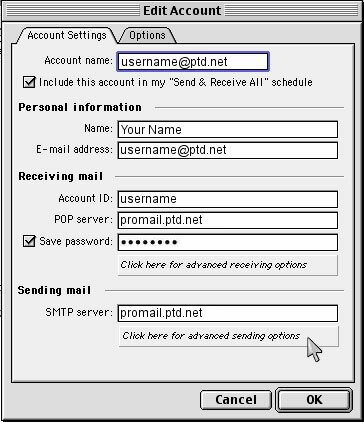 In the box labeled "Incoming mail server:", enter "promail.ptd.net" in all lower case letters. 10. 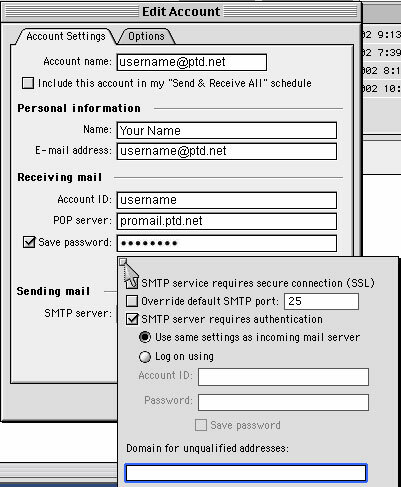 In the box labeled "Outgoing mail server (SMTP):", enter "promail.ptd.net" in all lower case letters. 11. In the box labeled "User Name:", enter the beginning part of your PenTeleData email address. This is every thing before the "@ptd.net". 12. In the box labeled "Password:", enter the password that corresponds to your "User Name" entered above. When typing your password, only a series of "***" will appear for password confidentiality. 13. When your screen resembles the window below, click on the "More Settings…" button. 14. Click on the "Outgoing Server" tab on the top of this window. 15. 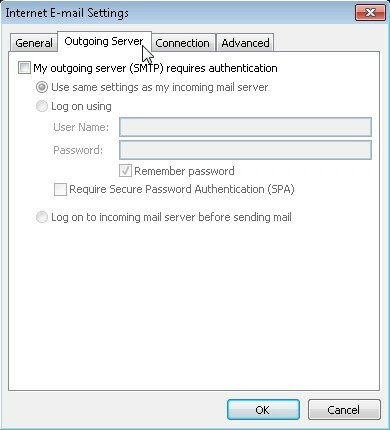 Place a check next to "My outgoing server (SMTP) requires authentication", by clicking your mouse over the box one time with the left mouse button. Then click "OK". 16. You will now be returned to the "Add New E-mail Account" window, click "Next" to continue. 17. The "Add New E-mail Account" wizard has now been completed. Click "Finish" to close the wizard. 18. The "User Name" dialog box will now appear. Type your name in the box labeled "Name:" and your initials in the box next to "Initials:", then click on "OK" to finish. 1. 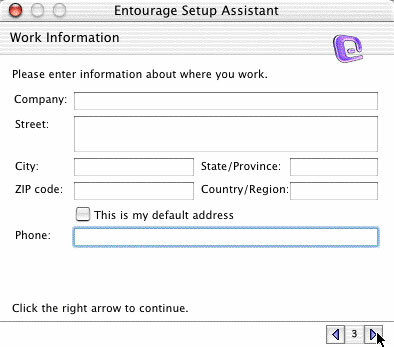 Open Entourage by double-clicking the "Entourage alias" on your "Desktop" or by clicking the "Entourage icon" in the "Dock." You can also open Entourage by selecting "Applications" from the "Go" menu at the top. 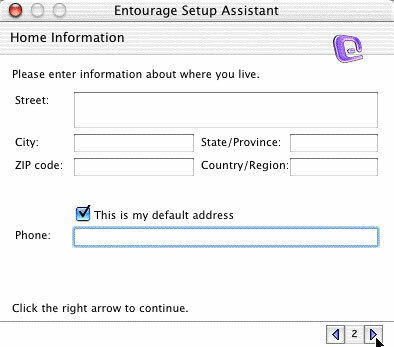 The "Entourage Setup Assistant" dialog box will now appear. 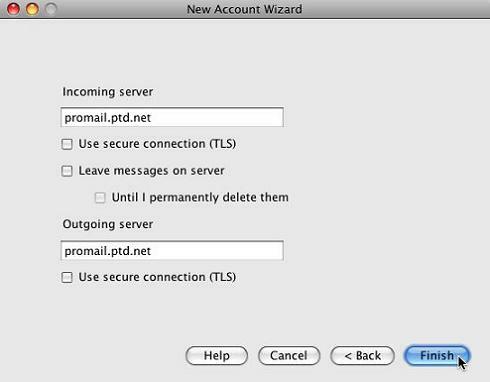 If the wizard does not appear, your email program may already be configured to send and receive email. 2. Enter your name and click the "Right" arrow in the lower right as shown below. 3. 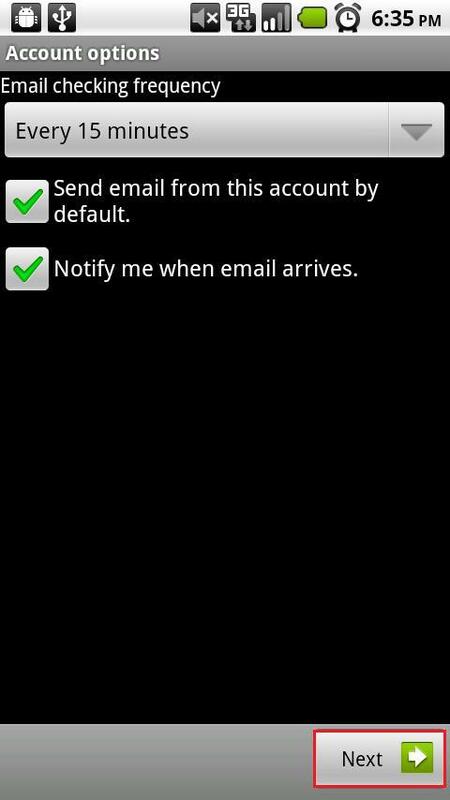 Enter your contact information in this screen and click the Right arrow in the lower right as shown below. 4. Enter your business information in this screen and click the Righ" arrow in the lower right as shown below. 5. 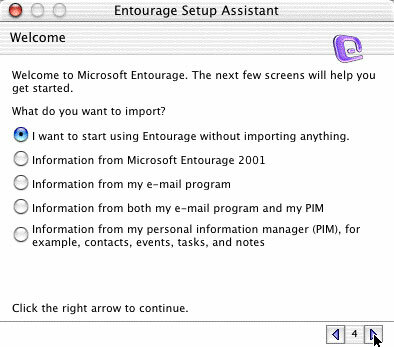 On the next screen, select "I want to start using Entourage without importing anything" and click the Right arrow in the lower right as shown below. 6. 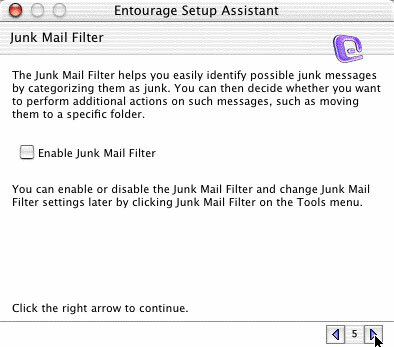 Check the "Enable Junk Mail Filter" checkbox if you would like to use Entourage's Junk Mail Filtering. This option helps identify possible junk mail messages. It can be turned "on" or "off" at any time. After making your selection, click the Right arrow in the lower right as shown below. 7. In the box labeled "Your name", enter your name as you would like it to appear when people receive email from you. When you are finished, click the right arrow in the lower right as shown below. 8. Place a dot in the circle next to "I already have an e-mail address...". 9. 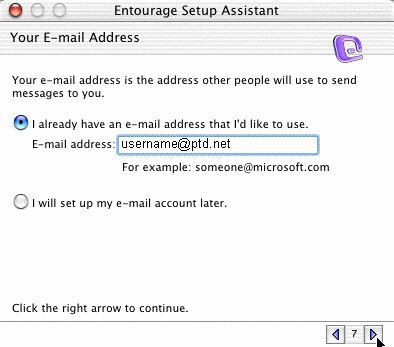 In the box labeled "E-mail address," enter your username followed by "@ptd.net" in all lower case letters. When you are finished, click the right arrow. 10. 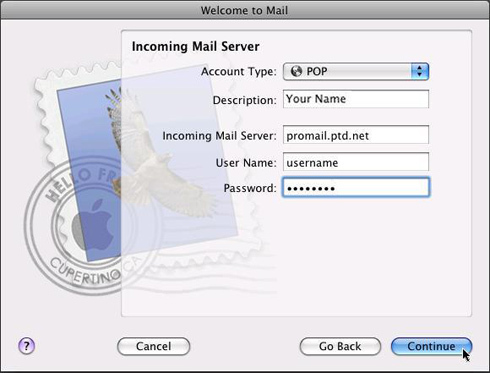 In the box labeled "Incoming mail server", enter "promail.ptd.net" in all lower case letters, without the quotation marks. 11. 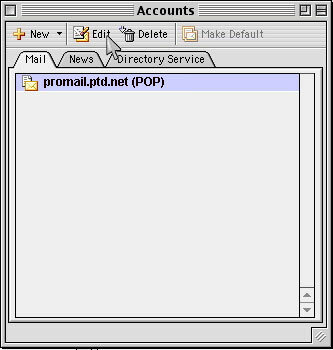 In the box labeled "Outgoing mail server", enter "promail.ptd.net" in all lower case letters, without the quotation marks. When you are finished, click the right arrow. 12. 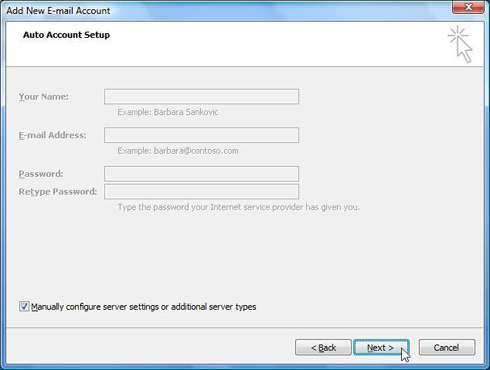 In the box labeled "Account ID", enter the beginning part of your email address. This is everything before the "@ptd.net". 13. In the box labeled "Password", enter the password that corresponds to your "Account name" entered above. When typing your password, only a series of "***" will appear for password confidentiality. 14. When you are finished, click the right arrow. 15. The next window will ask you for an "Account name." We suggest you enter your email address for ease of reference. When you are finished, click the "Finish" button at the bottom. You will be returned to the mail Entourage window. 16. We will now enable SMTP Authentication. Select "Accounts" from the "Tools" menu at the top. 17. The Entourage "Accounts" window will now appear. Click on the "Mail" tab at the top. 18. On the next window, select your PenTeleData email account and click on the "Edit" button at the top. 19. The Entourage "Edit Account" dialog box will now appear. Click on the button labeled "Click here for advanced sending options". 20. 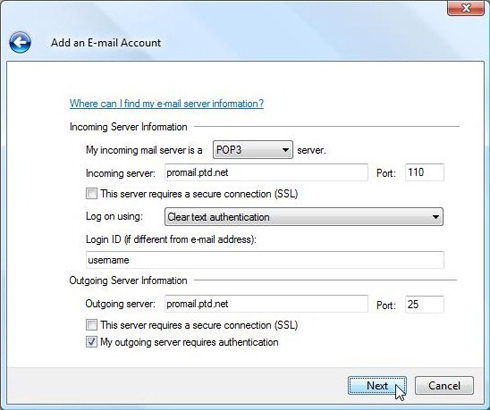 Place a "check" in the box next to "SMTP server requires authentication" by clicking on the box once with the mouse button. 21. Click on the "Close" button in the upper left of the advanced settings window. 22. Finally, click on "OK" and your new settings will be saved. 1. 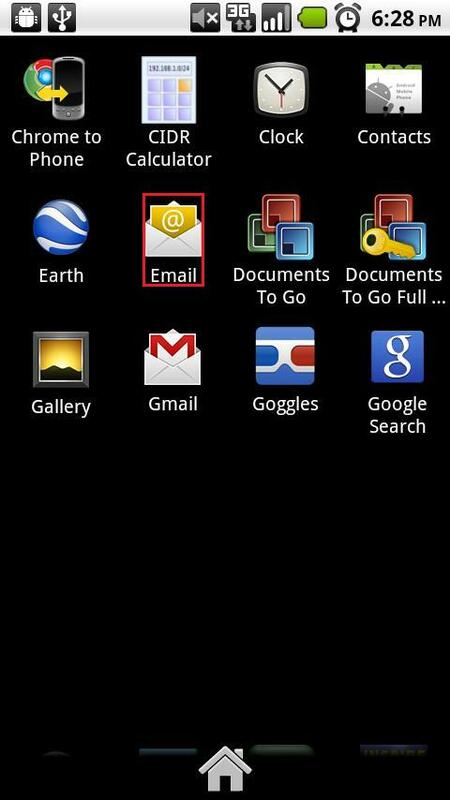 Open Mail by clicking the "Mail icon" in the "Dock" or by selecting "Applications" from the "Go" menu at the top. 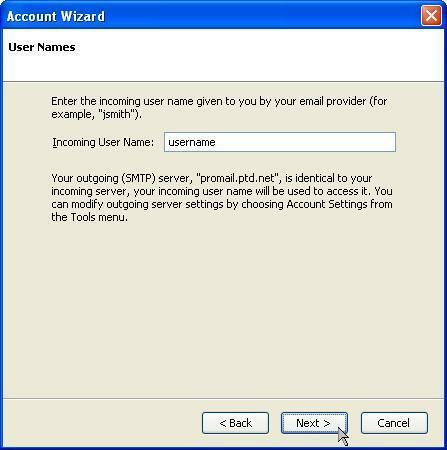 If the wizard does not appear, your email program may already be configured to send and receive email. 2. 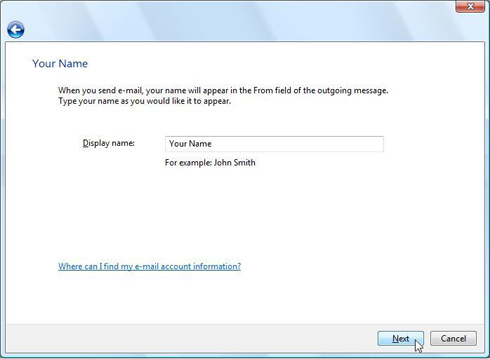 In the box labeled "Full Name:", enter your name as you would like it to appear when people receive email from you. 3. 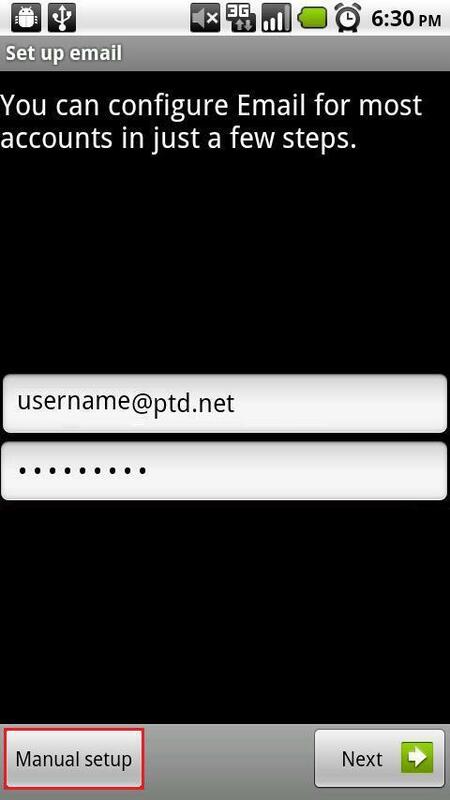 In the box labeled "Email Address:", enter your username followed by "@ptd.net" in all lower case letters. 4. In the box labeled "Password:", enter the password that corresponds to your username entered above. When your window resembles the one shown below, click the "Continue" button at the bottom. 5. In the box labeled "Account Type:", select "POP". 6. In the box labeled "Description:", type Your Name. 7. 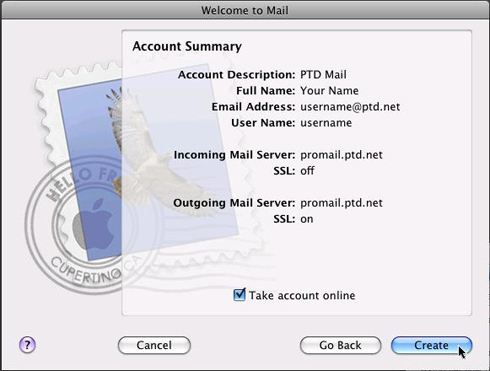 In the box labeled "Incoming Mail Server:", enter "promail.ptd.net" in all lower case letters, without the quotation marks. 9. In the box labeled "User Name:", enter the beginning part of your email address. This is everything before the "@ptd.net". 10. In the box labeled "Password:", enter the password that corresponds to your "User Name" entered above. When typing your password, only a series of dots will appear for password confidentiality, click "Continue". 11. 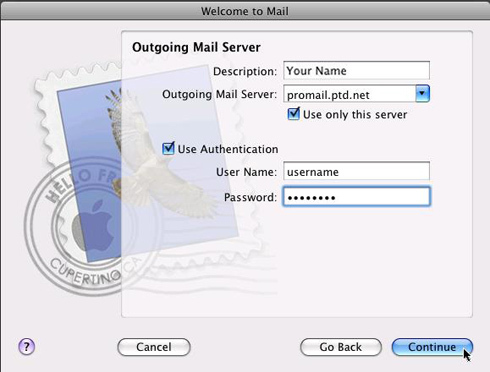 In the box labeled "Outgoing Mail Server:", enter "promail.ptd.net" in all lower case letters, without the quotation marks. 12. Place checkmarks in the boxes next to "Use only this server" and "Use Authentication". 13. Enter your username in the field labeled "User Name:", this is everything before the "@ptd.net". 14. Enter your password in the "Password:" field and click "Continue". 15. On the "Account Summary" window verify all the settings are correct. If any settings are incorrect, click "Go Back", otherwise click "Create". 1. Tap the "Apps menu" from your home screen. 2. From the list of installed apps tap "Email". 3. The "Set up email" wizard will now open. 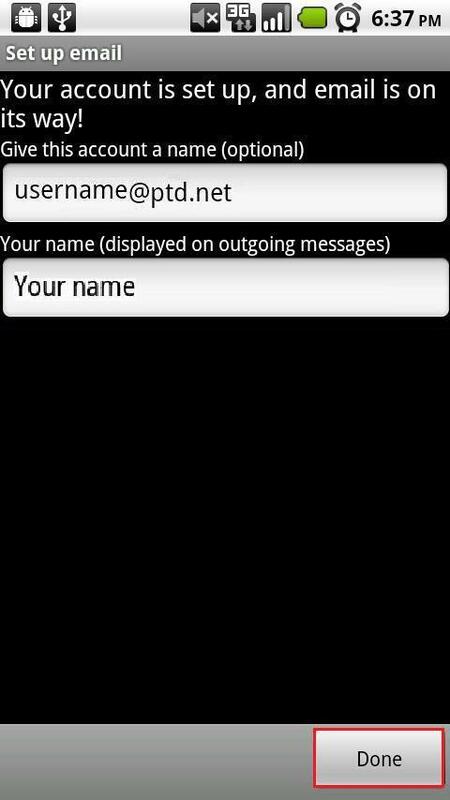 In the box labeled “Email address” enter your username followed by "@ptd.net". In the box labeled "Password", enter the password that corresponds to your "Email address" entered above. When typing your password, the letters will quickly change to a series of dots for password confidentiality. 4. Tap “Manual setup” to continue. 6. The "Username" and "Password" boxes will automatically be filled in. 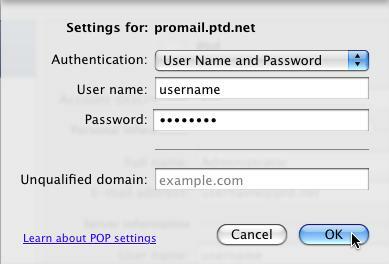 In the box labeled "POP3 server" type in "promail.ptd.net" in all lower case letters, without the quotation marks. 7. Tap "Next" to continue. 8. 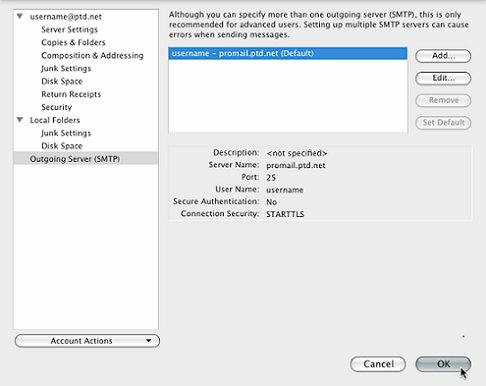 In the box labeled "SMTP server" type in "promail.ptd.net" in all lower case letters, without the quotation marks. 9. In the box labeled "Port" enter "587". 10. Check the box next to "Require sign-in". In the box labeled "username" enter the beginning part of your email address. This is everything before the "@ptd.net". 12. When finished click "Next". 13. The "Account options" window will now open. Click "Next" to continue. 14. 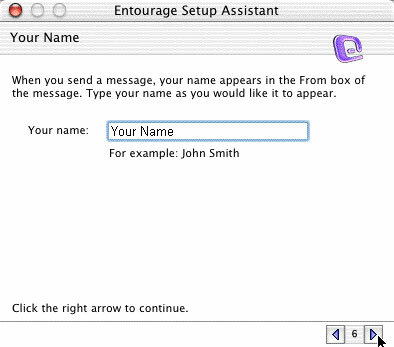 In the box labeled "Your Name", enter your name as you would like to appear when people receive email from you. When you are finished click "Done". 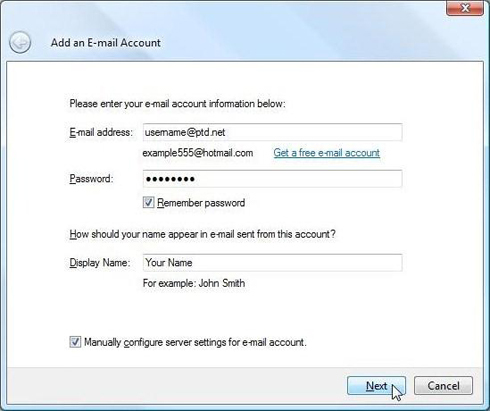 These instructions will guide you through the setting up of your email account in Windows Live Mail. 1. Open Windows Live Mail by either selecting the “Windows Live Mail” icon from the Windows “Desktop” or by selecting the “Windows Live Mail” icon from the “Start” menu (known as the “Windows” menu in Vista and Windows 7). 2. The "Add an E-mail Account" wizard will now open. 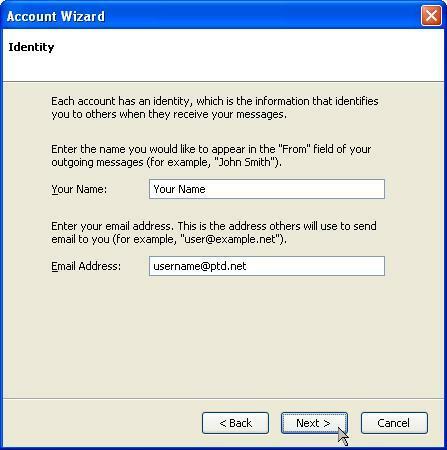 If the wizard does not appear, your email program may already be configured to send and receive email, please contact Technical Support at (800) 281-3564. 3. In the box labeled "E-mail address:", enter your PenTeleData email address. 4. In the box labeled "Password:," enter the password that corresponds to your "User Name" entered above. When typing your password, only a series of "***" will appear for password confidentiality. 5. In the box labeled "Display Name:", enter your name as you would like it to appear when people receive email from you. 6. 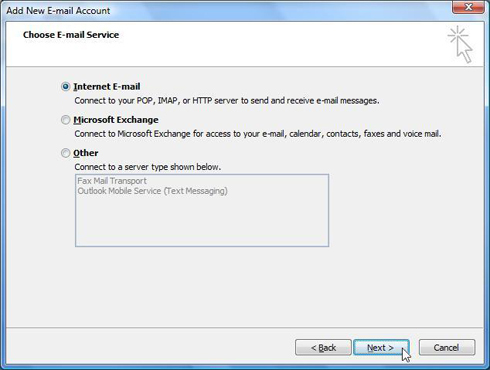 Place a check in the box next to "Manually configure server settings for email account" and click "Next". 7. 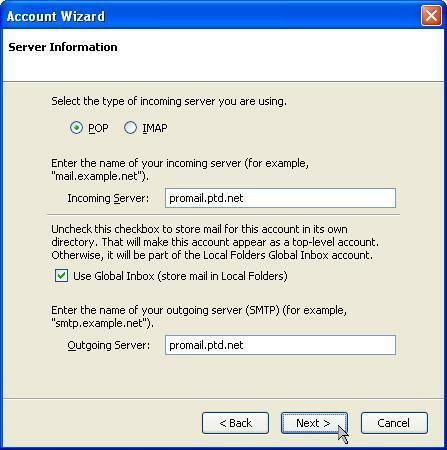 In the box labeled “Incoming server:,” enter “promail.ptd.net” in all lower case letters. 8. 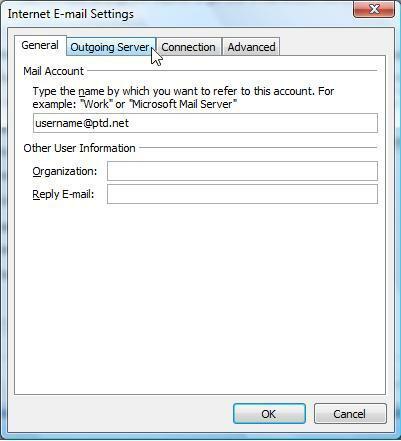 In the box labeled “Outgoing server:,” enter “promail.ptd.net” in all lower case letters. 10. Click “Finish” to close the wizard. 1. Open Windows Mail by either selecting the "Windows Mail" icon from the Windows “Desktop” or by selecting the "Windows Mail" icon from the "Windows" menu (formerly known as the “Start” menu). 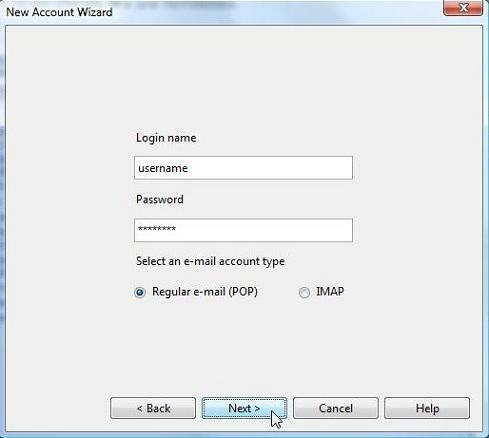 The Windows Mail email setup wizard dialog box will now appear. If the wizard does not appear, please contact Technical Support at (800) 281-3564 for further assistance. 2. The email setup wizard will ask for a "Display name:". Enter your name as you would like it to appear when people receive email from you. When you are finished, click "Next". 3. 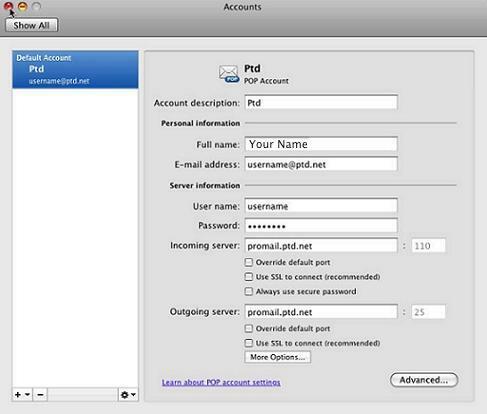 In the box labeled "E-mail address:", enter your username followed by "@ptd.net" in all lower case letters. When you are finished, click "Next". $. 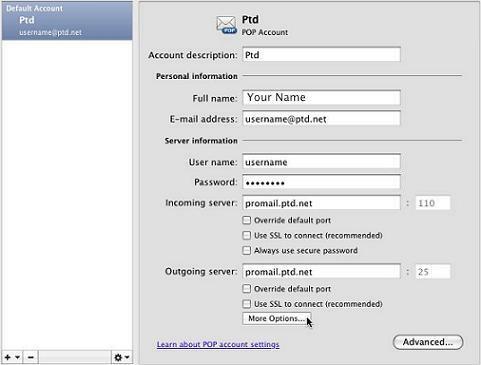 In the box labeled "Incoming mail (POP3 or IMAP) server:", enter "promail.ptd.net" in all lower case letters, without the quotation marks. 5. 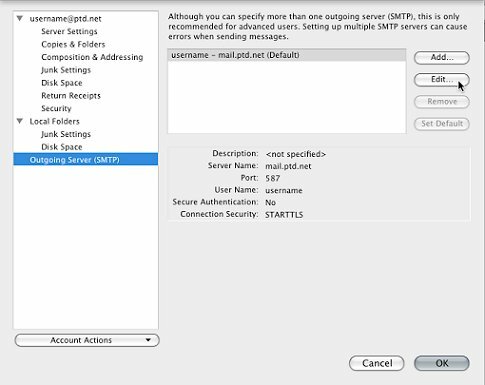 In the box labeled "Outgoing e-mail server (SMTP) name:", enter "promail.ptd.net" in all lower case letters, without the quotation marks. 6. Place a "check" in the box next to "Outgoing server requires authentication" by clicking on the box once with the left mouse button. When you are finished, click "Next". 7. In the box labeled "E-mail username:", enter the beginning part of your email address. This is everything before the "@ptd.net". 8. 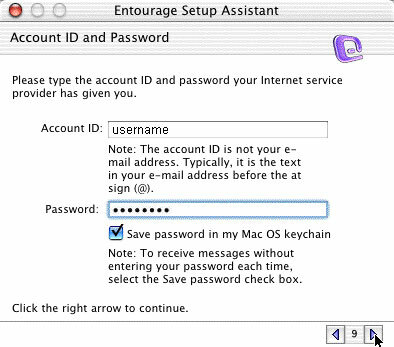 In the box labeled "Password:", enter the password that corresponds to your "E-mail username:", entered above. When typing your password, only a series of dots will appear for password confidentiality. When you are finished, click "Next". 9. 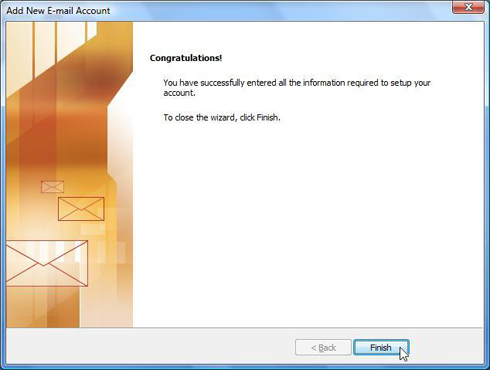 Click on the "Finish" button at the bottom to close the wizard and return to the main Windows Mail window. 1. 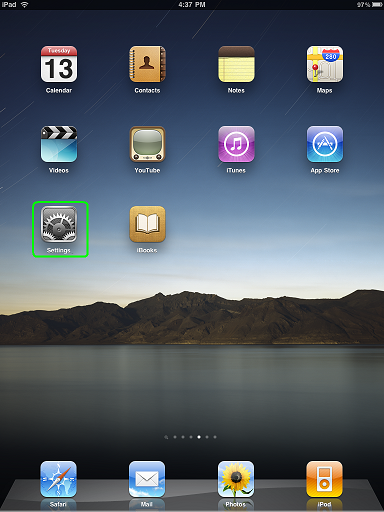 Tap "Settings" from your iPad's Home screen. 2. 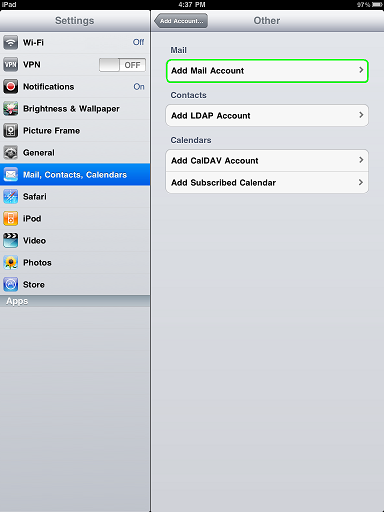 Tap "Mail, Contacts, Calendars" on the "Settings" pane. 3. Tap “Add Account…” to continue. 4. On the "Add Account…" pane, tap "Other". 5. Tap "Add Mail Account" to continue. 6. In the box labeled "Name", enter your name as you would like it to appear when people receive email from you. 7. In the box labeled "Address", enter your username followed by "@ptd.net" in all lower case letters. 8. In the box labeled "Password", enter the password that corresponds to your "Address" entered above. When typing your password, the letters will quickly change to a series of dots for password confidentiality. 9. In the box labeled "Description", enter what you want the account to be named, by default it will automatically be named your email address. When you are finished, tap "Save". 10. At the top of the "New Account" pane, tap the "POP" button. Scroll down to the "Incoming Mail Server" section. 11. 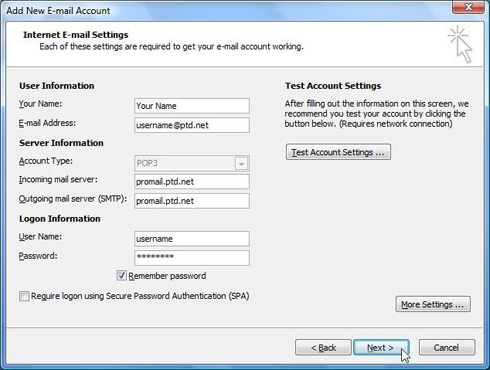 In the box labeled "Host Name", enter "promail.ptd.net" in all lower case letters, without the quotation marks. 12. In the box labeled "User Name", enter the beginning part of your email address. This is everything before the "@ptd.net". 13. In the box labeled "Password", enter the password that corresponds to your "User Name" entered above. When typing your password, the letters will quickly change to a series of dots for password confidentiality. 14. 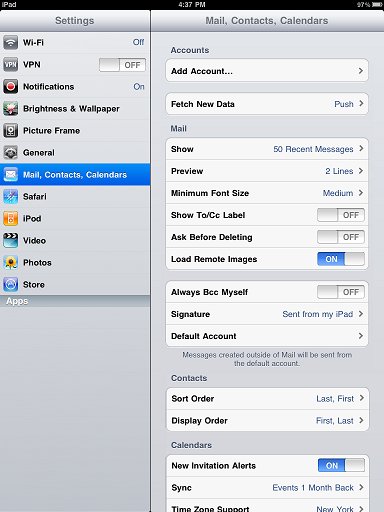 Scroll down to the "Outgoing Mail Server" section. 15. In the box labeled "Host Name", enter "promail.ptd.net" in all lower case letters, without the quotation marks. 16. In the box labeled "User Name", enter the beginning part of your email address. This is everything before the "@ptd.net". 17. In the box labeled "Password", enter the password that corresponds to your "User Name" entered above. When typing your password, the letters will quickly change to a series of dots for password confidentiality. 18. When finished tap "Save". Depending on the internet connection type you are using at the time, you may receive a message stating the iPad cannot connect to the mail server using SSL, and asking if you would like to connect without it. If you receive this message, tap "Yes". 1. 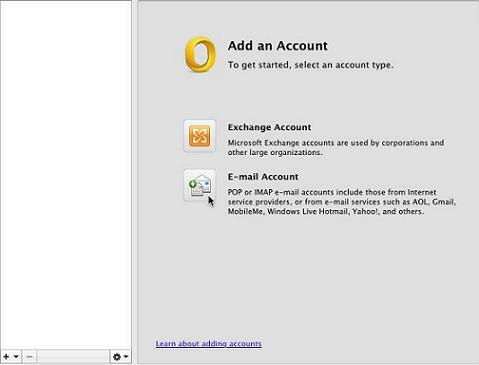 Begin by opening up Opera and select "Mail and Chat Accounts…" from the "Opera" menu. 2. Click "Yes" to continue. The Opera Mail email setup wizard dialog box will now appear. If the wizard does not appear, please contact Technical Support at (800) 281-3564 for further assistance. 3. Select "E-mail" then click "Next". 4. In the box labeled "Real name", enter in your name as you would like it to appear when people receive email from you. 5. 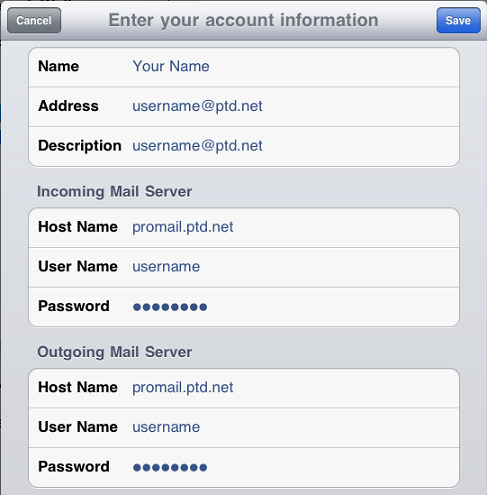 In the box labeled "E-mail address", enter your username followed by "@ptd.net" in all lowercase letters. When finished click "Next". 6. In the box labeled "Login name", enter the beginning part of your email address. This is everything before the "@ptd.net". 7. In the box labeled "Password", enter the password that corresponds to your "Login name" entered above. When typing your password, only a series of "***" will appear for password confidentiality. 8. 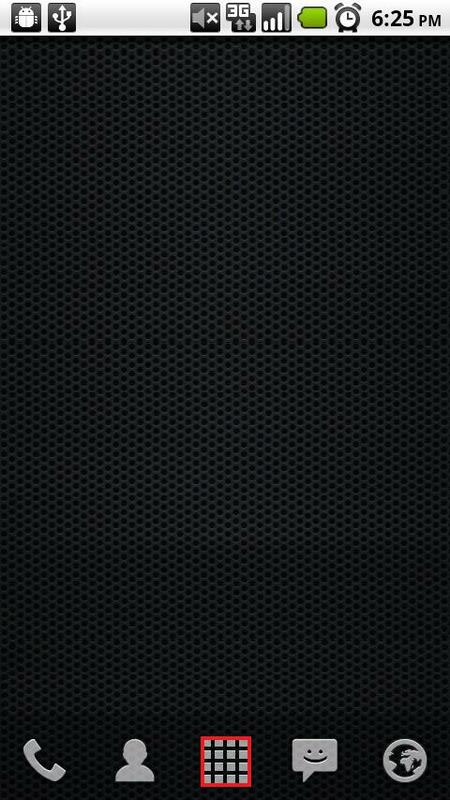 Opera will try to automatically populate the incoming and outgoing servers and these will need to be changed. 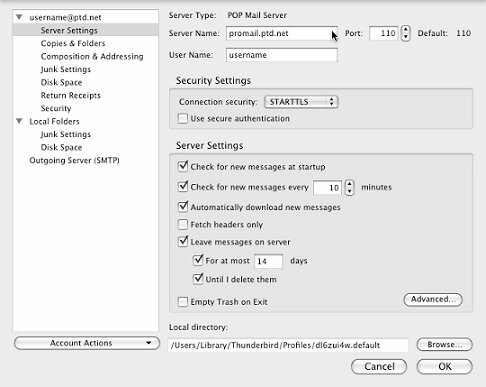 In the box labeled "Incoming server", enter "promail.ptd.net" in all lower case letters, without the quotation marks. 9. 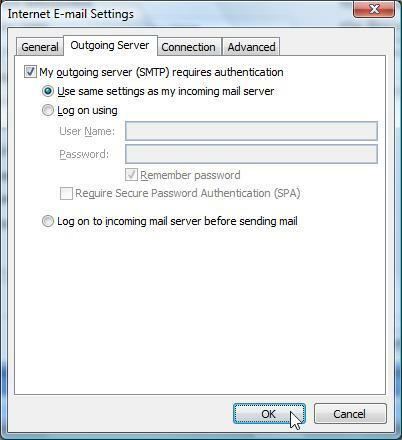 In the box labeled "Outgoing server", enter "promail.ptd.net" in all lower case letters, without the quotation marks and click "Finish". 1. Begin by opening up Opera and select "Mail and Chat Accounts…" from the "Tools" menu at the top. 1. Open Mozilla Thunderbird by either selecting the "Mozilla Thunderbird" icon from the windows "Desktop" or by selecting the "Mozilla Thunderbird" icon from the start menu. 2. 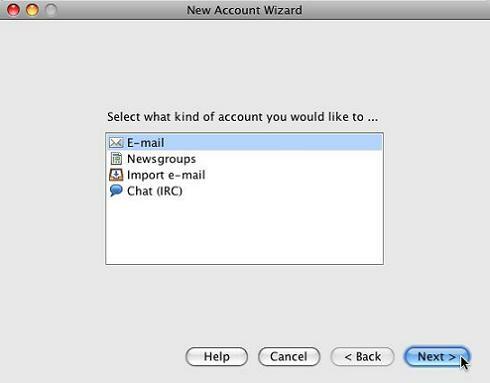 The Thunderbird "Account Wizard" dialog box will now appear. Place a dot in the circle next to "Email account" and click on "Next". 3. The setup wizard will now ask for your "Your Name". Enter your name as you would like it to appear when people receive email from you. 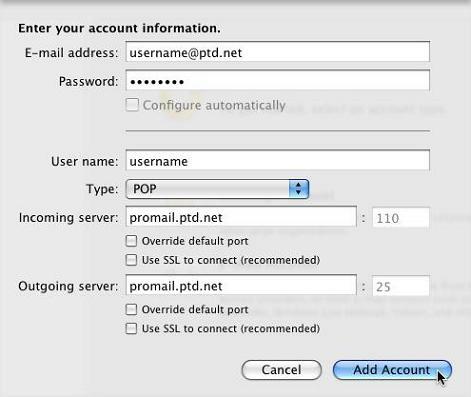 In the box labeled "Email Address", enter your username followed by "@ptd.net" in all lower case letters. When you are finished, click "Next" as shown in the window below. 4. 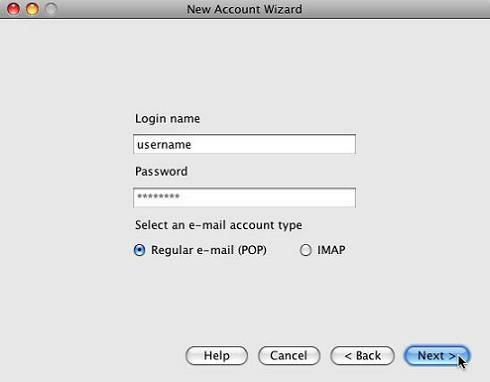 In the next "Account Wizard" dialog box, place a dot next to "POP". 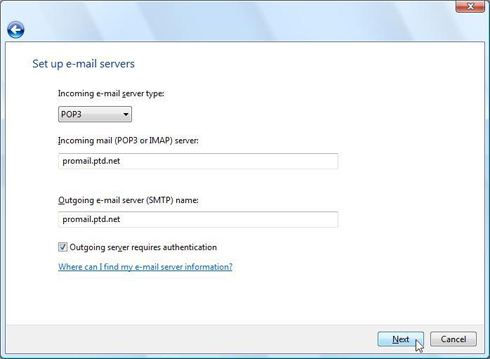 In the box labeled "Incoming Server", enter "promail.ptd.net" in all lower case letters, without the quotation marks. 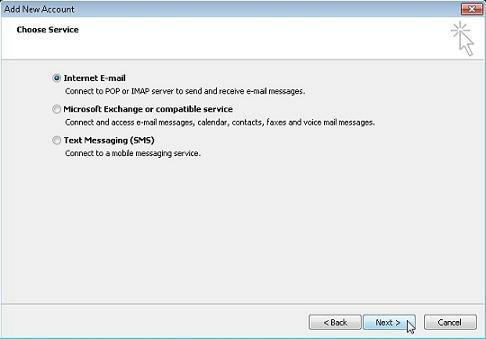 In the box labeled "Outgoing Server", enter "promail.ptd.net" in all lower case letters, without the quotation marks. When you are finished, click "Next". 5. In the box labeled "Incoming User Name", enter the beginning part of your email address. This is everything before the "@ptd.net". Once you have finished entering your username, click "Next". 6. 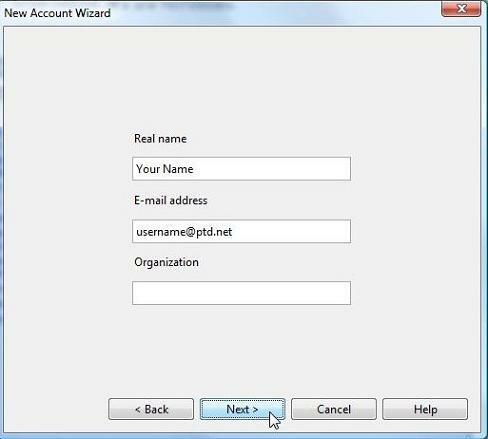 The setup wizard will now ask for an "Account Name". You can either leave this as is or change it to something more familiar (i.e. "Dad’s Mail"). Whether you leave the "Account Name" as is, or enter a different name, click "Next" when you are finished. 7. 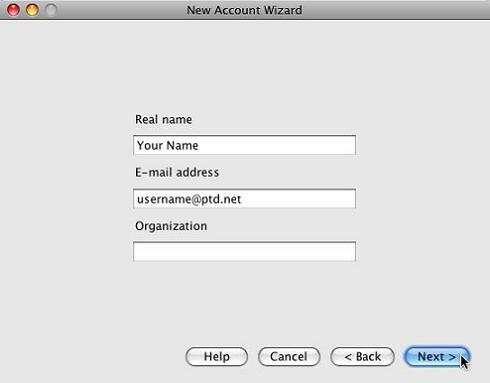 The last "Account Wizard" dialog box will now appear. Please verify that all of the information was entered correctly. If the information is correct your window should resemble the window shown below. Click on the "Finish" button at the bottom. If the information is not correct you can click on the "Back" button and make the appropriate changes. 8. You will be prompted for your password when Mozilla Thunderbird attempts to download your email. Enter your email password in the dialog box. 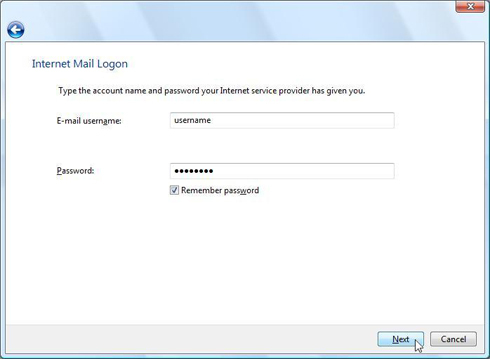 To have Mozilla Thunderbird save your password, click the "Use Password Manager to remember this password" option when you are prompted for your password. 1. 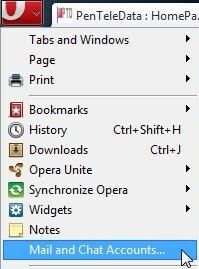 Open Thunderbird by double-clicking the "Thunderbird" shortcut on your "Desktop" or by clicking the "Thunderbird" icon in the "Dock". You can also open Thunderbird by selecting "Applications" from the "Go" menu at the top. 2. In the box labeled "Your name:", enter your name as you would like to appear when people receive email from you. 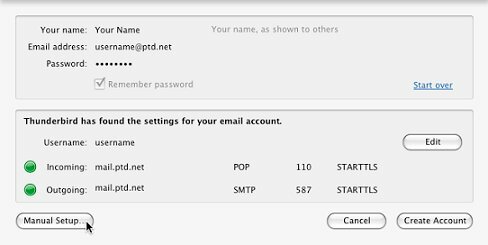 In the box labeled "Email address:", enter your username followed by "@ptd.net" in all lower case letters. In the box labeled "Password:", enter the password that corresponds to your "User Name" entered above. When typing your password, only a series of dots will appear for password confidentiality, click "Continue". 3. Thunderbird will now try to automatically find the email servers. After it is done click "Manual Setup...". 4. 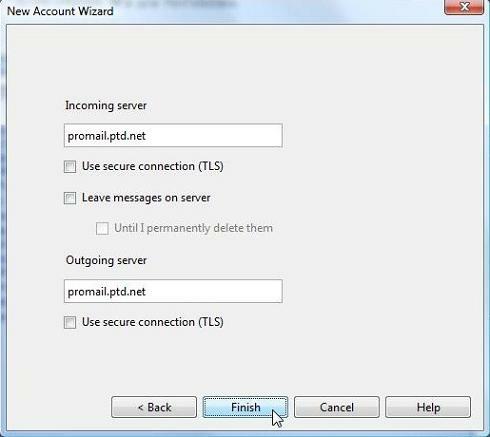 From the accounts window select "Server Settings" and change the "Server Name:" to "promail.ptd.net". 5. Click "Outgoing Server (SMTP)" from the accounts window, and then select your PenTeleData email account. Once selected click "Edit...". 6. 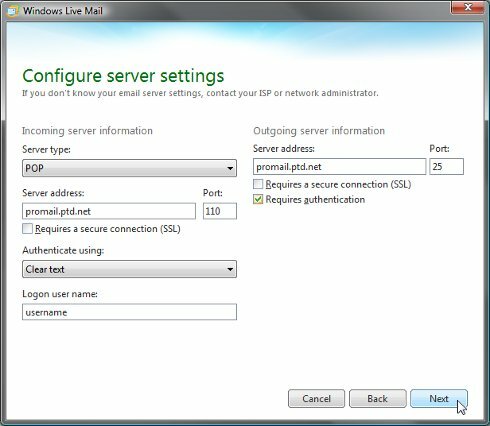 Change the "Server Name:" to "promail.ptd.net" and change the port to "25". Verify that "Use name and password" is checked with your corresponding username in the "User Name:" field. Click "OK" to continue. 7. On the account summary window, verify all the settings are correct. If all settings are correct click "OK".